From the back cover of the VHS and DVD boxes. Rick Deckard (Harrison Ford) prowls the steel-and-microchip jungle of 21st century Los Angeles. He's a "blade runner" stalking genetically made criminal replicants. His assignment: kill them. Their Crime:wanting to be human. The STory of Blade Runner is familiar to the countless fans. But few have seen it like this. BEcasue this is Director Ridley Scott's own vision of his sci-fi classic. 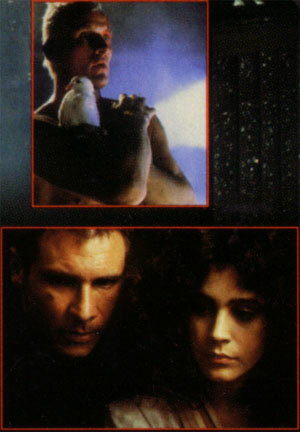 This new versiob omits Deckard's voiceover narration, develops in slightly greatewr details the romance between Deckard and Rachael (Sean Young) and removes the "uplifting" finale. The result is an heightened emotional impact: a great film made greater. Most intriguing of all is a newly included unicorn vision that suggests Deckard may be a humanoid. Do Androids Dream of Electric Sheep? is Deckard a replicant? As with allthings in the future, you must discover the answer yourself.